Freemasonry was a major cultural and social phenomenon and a key element of the Enlightenment. It was to have an international influence across the globe. 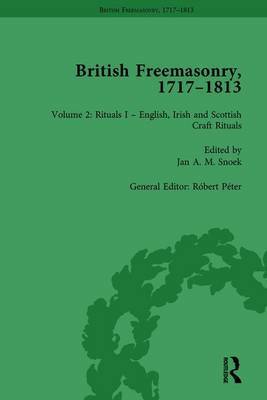 This primary resource collection charts a key period in the development of organized Freemasonry culminating in the formation of a single United Grand Lodge of England. The secrecy that has surrounded Freemasonry has made it difficult to access information and documents about the organization and its adherents in the past. This collection is the result of extensive archival research and transcription and highlights the most significant themes associated with Freemasonry. The documents are drawn from masonic collections, private archives and libraries worldwide. The majority of these texts have never before been republished. Documents include rituals (some written in code), funeral services, sermons, songs, certificates, an engraved list of lodges, letters, pamphlets, theatrical prologues and epilogues, and articles from newspapers and periodicals. This collection will enable researchers to identify many key masons for the first time. It will be of interest to students of Freemasonry, the Enlightenment and researchers in eighteenth-century studies.